We've been doing some testing and Foneshow works great on the iPhone! Here you see the notification SMS's in the iPhone SMS client. 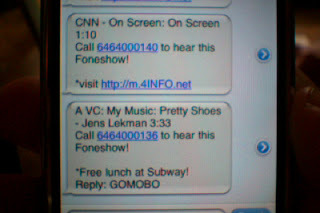 The iPhone threads conversations (just like the Treo) so the Foneshow SMS "conversation" becomes a menu of your freshest available programming. It's kind of like bloglines for podcasts (on your phone). Notice the dynamically allocated phone numbers which allow the user to access an individual piece of programming. You can also clearly see the advertisements within the notification messages (these ads are provided by 4info.net, our messaging partner. If you want to advertise on Foneshow text messages let us know and we'll put you in touch with the right people at 4info). While we're pleased that Foneshow works great on the iPhone, we are unsurprised. We designed Foneshow to work well on essentially any cell phone. 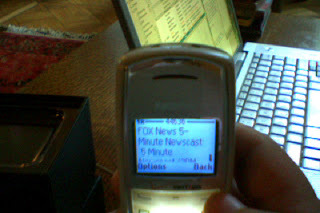 Here's how Foneshow looks on a Nokia 2128i. Now admittedly, Foneshow looks sexier on the iPhone (but really, everything looks sexier on the iPhone). But the functionality is all there. The SMS archive acts as a menu. Dialing a number embedded in a SMS just requires the user to hit the send key. Most importantly, the Nokia 2128i is typical of the kind of cell phone that US cellular carriers give away. This one is one of our test/demo units. It cost us $9 with a one year plan. It would have been free if we had opted for a 2 year plan. 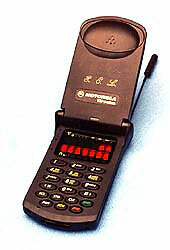 These inexpensive cell phones make up a major part of the 220 million cell phones in the US. If you want to make a mass market product you have to be able to reach a big audience. So what phones don't work with Foneshow? Our testing has found very few. Nic's Mom's StarTAC (circa 1997) does not have text messaging, so it doesn't work (of course it's an analog phone, my guess is it won't even make phone calls pretty soon). We also recently discovered that T-Mobile prepaid does not accept text messages from short codes. Regular T-Mo accounts work just fine. There is a work around for the T-Mo prepaid problem using the T-Mo email gateway. It's not an elegant solution and we're hoping T-Mo changes their prepaid short code policy.